Organizers estimate they have helped more than 7,000 people released by immigration authorities since October, but resources are running thin without a dedicated funding source. PHOENIX — More than 60 immigrant families were dropped off at a Phoenix Greyhound bus station Thursday, with little information or resources on where to go or what to do next. “They look sick, they look tired, and everyone has a bag with a few items of clothes. 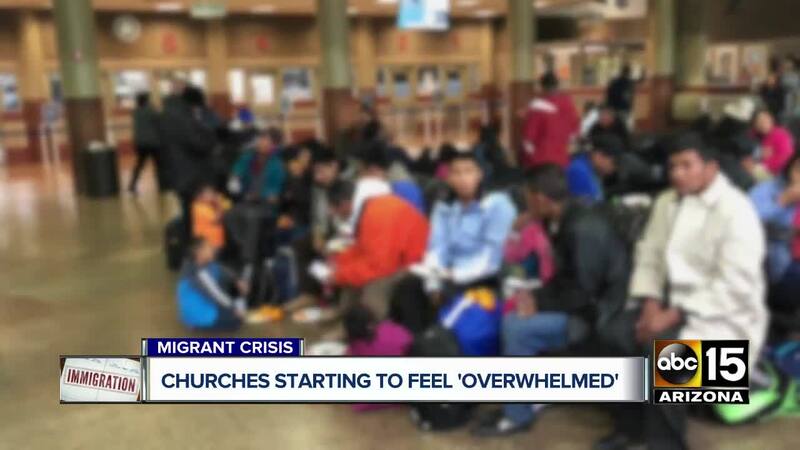 No food, no money, no way to call their family members," said Israel Camacho, pastor at Nueva Esperanza Church, of how people seeking asylum look when dropped off by immigration authorities. “When you drop off families here, who is going to be here to check on the kids?" Camacho says several Valley churches have contacted ICE officials and said they wouldn't be accepting migrants this week, after a near-constant acceptance of migrants for the past several months. Immigration and Customs Enforcement authorities, faced with an increasing number of people seeking asylum, began large-scale releases of migrants to churches in October in an effort to comply with federal rules regarding those whose asylum cases are going through the court system. Under the law, ICE can only hold a migrant family in one of its detention centers for 20 days before they must be released. The past three months have overwhelmed the resources available to those migrants, with some churches receiving and caring for hundreds of people each day. The constant care provided to migrants has some church volunteers getting sick and the organizations that have stepped up to help them are running out of resources. In light of that, church leaders say ICE has resorted to dropping families off at bus stops, with little to no information on how to connect with family members already living here. "We need more help." Camacho said. He worries churches can't sustain the overwhelming need these migrants families have for much longer, but are conflicted, and don't want mothers, fathers and children left high and dry. "I think there’s not a lot of options." he said. "That’s a bad thing, because they need to figure out something else. If they are depending on church is just to provide for the families, and think that we’re just going to continue to do that for years, that’s not gonna happen." Camacho says they're expecting more buses to arrive Friday morning. Volunteers from his church and several others across the Valley have still stepped up, and are helping bring in food, water and even clothing to those left at the bus stop.